Inflammation and/or infection of the mucous membranes of the larynx (voice box) that interferes with breathing and causes the voice to become hoarse or disappear altogether. Organ or part of body involved: Larynx and vocal cords. Symptoms and indications: Hoarseness and loss of voice. There may be a sore throat and difficulty in swallowing or a feeling of a lump in the throat. The person may feel feverish. Sometimes the loss of voice is the only symptom and the person otherwise feels quite well. 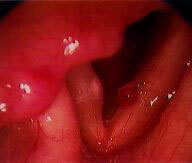 Causes and risk factors: The usual cause is a viral infection, although sometimes laryngitis is bacterial in origin. Allergens that produce respiratory symptoms or use of the voice as shouting or singing and (rarely) cancer of the larynx may cause the condition.